What Should People Do When They Wait? 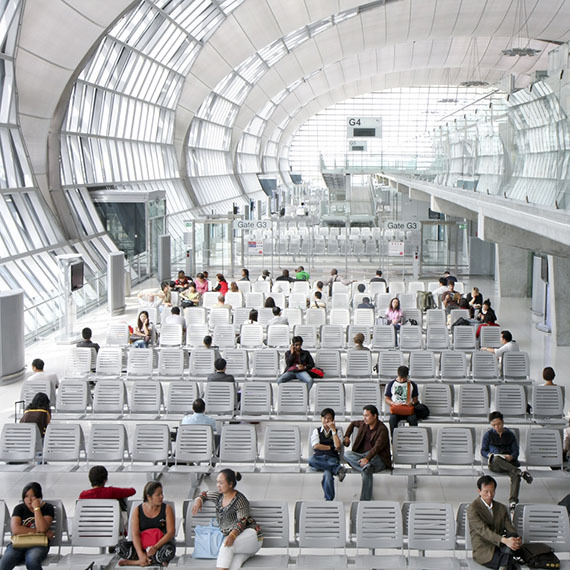 How do you design for the function of waiting? Do your building occupants ever really wait? Typically, they move from one activity to another, but it is equally important to also design for those in-between moments. What happens during those “between” moments can really impact an occupant’s experience; thus, as a designer, you can make what goes on inside a waiting room a great experience. Take hospitals, for instance. Once a patient has gone through the initial phase of “checking in”, then begins the often long and frequently boring wait. Unfortunately, many hospital designs don’t place an emphasis on providing for an optimal waiting area — and that is really a missed opportunity. Just think of the things that could be accomplished and provided for patients, if only architects would give some serious thought to what patients actually need during this time. For example, within a hospital waiting room, patients could get views of nature or be surrounded by calming colors and pleasing sounds — thus, soothing patient anxiety and stress. Another tactic that would help patients endure those long “waiting periods” involves giving thought to the arrangement and ergonomics of where they sit. Comfort while waiting is key, particularly for hospital patients who might be in a great deal of pain. I have noticed that many waiting rooms incorporate televisions which play TV channels that patients can watch or listen to. In essence, this is a great idea — but what about those that don’t want to watch television, particularly when a waiting room only broadcasts news or other intense shows. It is important to realize that there is a difference between trying to distract a patient from boredom versus bombarding them with additional stressors. So, what can waiting rooms do? They can serve as buffer zones, transitional areas or even learning places — as they receive occupants coming from one place and then prepare them to go into the next. For example, hospital waiting rooms can serve all three of these functions at once. Thus, waiting room areas can be an important link that makes your architectural design work more smoothly for your occupants. In reality, your occupants may spend a lot of time in these zones. If not designed properly, these areas could be your building’s weakest link — which could ultimately weigh down the success of your overall design. Conversely, the design of your waiting room could be so successful that it becomes one of the strongest links in your design. Don’t underestimate the challenge involved in designing a good one.